Wondrous Willow debuts six years after daughter’s cancer diagnosis. DAYTON, Ohio — “Tell me a story,” Christine’s daughter, Victoria, requested one night several years after the mother and her then 11-year-old daughter spent an intense seven months in and out of Cincinnati Children’s Hospital. Diagnosed with a germinoma brain tumor, Victoria underwent surgery, chemo and radiation. One night after Christine spontaneously made up the tale of Willow, her daughter told her the story had made her cry—in a good way. Christine knew she had a winner, recording it in her writing journal so she wouldn’t forget it. Willow is about an Old World Swallowtail butterfly born into the mountains of Colorado who marvels at her existence, but begins to doubt she has a special purpose, when a man-made fire changes her life and her mountain home forever. “September is Childhood Cancer Awareness month. Wondrous Willow is not only dedicated to Victoria for what she courageously endured, but to families around the world who have, or currently are braving the illness of a loved one. I wanted Victoria to know that though life is challenging at times, everything is purpose-filled, including her,” says Horner. 17-year-old Joey McGrellis, the book’s illustrator, also came by way of Victoria when she mentioned a friend’s doodling had become so popular, he regularly received requests. Christine was pleasantly surprised to find out Joey was head of his high school’s art department, and quickly asked for a sample of his artwork. The book includes a special message from the author and a thank you to Cincinnati Children’s Hospital. 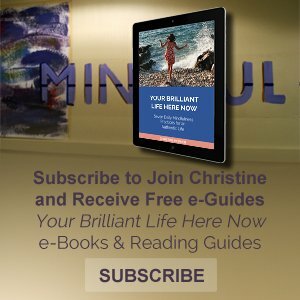 Wondrous Willow comes on the heels of Christine’s summer non-fiction release, Awakening Leadership: Embracing Mindfulness, Your Life’s Purpose, and the Leader You Were Born to Be. Her next project is her first novel, Crystal True, the first in a trilogy based on a screenplay she wrote in 2014 for a writing contest, publishing in 2016. All proceeds to benefit Joey McGrellis and Victoria Horner’s college education. Yugen Press is a fiction imprint of In the Garden Publishing.